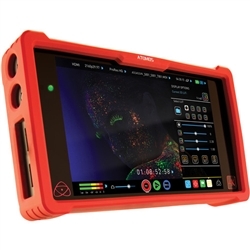 The Atomos Ninja Assassin 4K HDMI Recorder and 7" Monitor combines a color-calibrated 1920 x 1200 resolution display with 4K video recording and edit-ready codecs. The Ninja Assassin utilizes a loop-through 4K HDMI input to record signals at resolutions up to UHD 4K (3840 x 2160) at 23.98, 24, 25, 29.97, and 30p, as well as Full HD (1920 x 1080) video up to 120 fps when used with capable cameras. The Ninja Assassin records 10-bit, 4:2:2 UHD 4K and HD video to Apple ProRes HQ, 422, or LT formats. It can also record HD video using Avid's DNxHD format and UHD 4K video using Avid's DNxHR codec. Video is recorded to single 2.5" HDD and SDDs for fast and reliable write speeds. As a monitor, the Ninja Assassin features a 7" IPS capacitive touchscreen display with resolution of 1920 x 1200. It is Rec. 709 color calibrated and supports multi-frequency operation (48/50/60 Hz) for monitoring of a variety of input frame rates. 4K signals can be internally down-converted and output in 1080p at the same frame rate. The Ninja Assassin also includes custom 3D LUT support. There are also a variety of onscreen tools to help you set up your shots, including a full waveform monitor, RGB parade display, vectorscope, focus peaking, and other framing, focus, and exposure assisting tools. Bypass your camera's internal compression and record UHD 4K (3840 x 2160) video to Apple ProRes over HDMI at 23.98, 24, 25, 29.97, or 30 fps. The 4K-capable HDMI input makes the Ninja Assasin particularly useful for recording 4K at 10-bit from DSLR and Mirrorless cameras that output clean video signals via HDMI. Record in 4:2:2 Apple ProRes or Avid DNxHD or DNxHR formats from your camera's uncompressed HDMI output, bypassing your cameras internal compression and data loss. Uncompressed Cinema DNG Raw 4K video is also supported from capable cameras. The 7" IPS screen features a 1920 x 1200 resolution and provides a wide viewing-angle of 178° for easier off-axis monitoring. The screen is calibrated to SMPTE Rec. 709 with 100% gamut and D65 white point, letting you monitor your colors with confidence. A standard Canon C-Log calibration is also available for use with Canon EOS Cinema cameras, so you won't have to look at flat, washed-out looking images on set. You can preview looks on set thanks to the ability to load 3D LUTs . Simply load Cube files on an SSD and access via the "Display Options" button on the home screen. The Ninja Assassin offers a comprehensive set of tools to help you set up, focus, and properly exposure your shots. These tools include a full waveform monitor, RGB parade display, luma overlay, vectorscope with zoom, and a test pattern generator for signal calibration. The monitor also provides focus peaking with multiple levels and colors, false color in two modes, and fully adjustable zebra from 0 to 100%. Trigger record start/stop and record time code straight from the camera with Atomos' HDMI time code trigger protocols from Sony, Canon, and other cameras. Box Dimensions (LxWxH) 11.0 x 6.8 x 4.0"